As of today, I’m enjoying a 15.41% annualized return on my investments with Lending Club spread over 19 loans. Lending Club is the awesome peer to peer lending investment website where you can lend money without a bank straight to individuals who need it the most. The beauty of the service for investors is that you can earn a great interest rate on your investments. For those of you who are not familiar with Lending Club, there are usually about 180 loans on the website at any given time waiting for lenders like you and me to come along and fund them. And, you can search through them all by several criteria. Check out my review of Peer-to-Peer Lending, what it is, and how to get started. My portfolio of loans primarily contains a mix of Grade C, D, and Grade E loans. I do not waste my time with conservative A or B class loans which do not pay very much interest. One of the most important things is picking out which loans to invest in. Here are some of my lending criteria that I use when choosing loans with great returns. While savings accounts, money market funds, and certificates of deposit are paying minuscule rates of return, I continue to be quite happy with my Lending Club experience and the excellent return that I have been earning. I’m curious as to how many notes you’ve invested in, and how long you’ve been doing this? I just looked over your criteria, and you’re taking a much more risky approach than I am. I don’t look at credit grade per se, but my criteria are such that I typically end up heavy into the A and B levels with some C, and rarely anything lower than that. I’ll be interested to see how your numbers hold up in the long run. Peer to peer lending seems to be on the rise with regards to popularity. Micro-finance sites such as Kiva are also gaining some buzz. 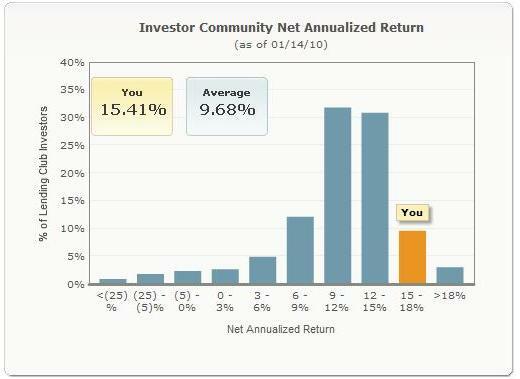 I haven’t tried peer to peer lending, but seems that your portfolio is doing good, with 15% Annual rate of return. I’m following your updates to your peer to peer portfolio, and the more I read updates the more I’m becoming to think that I might include this to my portfolio soon.